Welcome to the new HRC website! It’s not just our site that’s new though – our home has moved, to Ashby Road Sports Ground. All training sessions will now start from Ashby Road (Tuesdays and Thursdays at 6.15). There’s ample parking, as well as changing and toilet facilities. To celebrate our move, we’ll be having cake this week! Starting from Ashby Road – followed by celebratory cake! Well done to everyone who ran this morning’s lovely flat race in Kibworth. Full results here. This was the last winter league race of the season. Well done to everyone who ran all five races – Kate, Gill, Debbie, Helen, Sarah M, Sally, John and Paul C.
Another great team turnout for the hills at Markfield. Full results here. This year’s national cross country final took place this morning at Sinai Park in Burton, in the rain and mud. And – WE WON IT! A massive well done to everyone who took part, and everyone who’s run a cross country race this season. A real team victory! Well done to everyone who’s run a cross country race this season – the team came first in the league! The men also won their league, with women coming third in theirs. Brilliant result! 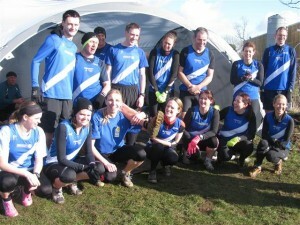 We’ve now qualified for the national finals – please contact Steve if you are available to run on Sunday March 4th. Please note – you must have run at least two cross country races this season to qualify. Another great turnout for Desford’s 10k, which was run in Market Bosworth. The first winter league race will take place this Sunday, 29th January, at Barrow upon Soar. 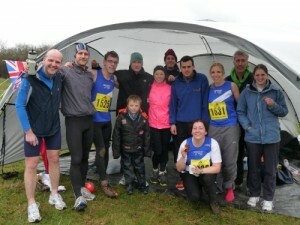 Well done to everyone who turned up on New Years Eve to run a cold and muddy 10K cross country. Happy New Year to all of our members. The presentation night for awards gained during 2011 will take place on Saturday 28th January, at Ashby Road Sports Club. Tickets are £7 each, which includes a buffet. Please see Andie or Odette for tickets. We are delighted to announce that online entries are now open for this year’s Kitchen and Bathroom Warehouse Hinckley Half Marathon. Entries can be accessed via the Hinckley Half Marathon page. The sixth and final Derby Runner Cross Country race will take place on Sunday 19th February, at Manor Farm, Ullesthorpe. There will be a children’s race at 10.30, followed by the main race at 11. PLEASE car share where possible, as parking is limited.